The Colorado 100 will be my first ultra marathon kayak race. I was a swimmer in college and I’ve played many sports throughout my life; some team and some individual. My last endurance race was 113 miles on a road bike. I trained 3 months specifically for that event. I put in lots of miles and also some intervals. I have less experience as a kayaker than a cyclist, and I will be following a training program posted by the event organizers. It is said to provide you with a strong finish, and that you could do less and still finish the race. I previously mentioned my ultimate goal is to finish (though I do have a finish time in mind). You can find the training page at the race site. Basically, beginning Labor Day weekend I will start a program that puts me on the water 4 days a week. I will do a 6 mile time trial each month as one indicator of my improvement (I hope). Saturdays will be long. slow distance (the first week is 12 miles and builds to 50 miles sometime in August). The other three days of the week are less mileage with a specific paddle pace each day; either slow, moderate, or fast. What’s a fast, moderate, or slow pace you ask? All determined by percent of your maximun heart rate. 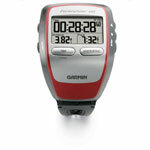 Yes, I will be wearing a HR monitor for the majority of my training. Fortunately I’m familiar with this technology from cycling, and will be utilizing the Garmin Forerunner 305, which by the way, also has GPS. So, at the same time I’ll have reliable data on speed and distance. Another feature that’s great with Garmin products is not only all the information the device records and stores, but then you can download all the data and get different reports and analysis of your performance. For myself, I find looking at this information a great motivational tool. I borrowed the idea of mounting the device on a Sticky Pod which sticks (via an industrial suction cup) right on the deck of my kayak. I’ll try to upload a picture of this soon. Besides paddling 4 days, on Tuesdays I’ll be cross-training on my bike. I may throw in a little swimming, but I haven’t decided that for sure yet. Finally, 2 days off a week. And, of course, lots of stretching. I’ve considered doing some Yoga, but I took one, short Yoga class about 20 years ago and hated it. But, I’m trying to keep an open mind! I can’t really explain why. There’s an attraction. It calls for my attention. It holds my gaze. I dream about it, even in the daylight. It’s all that is……….isn’t that metaphysical? This entry was posted on March 23, 2010 by DummyDiva. It was filed under Uncategorized and was tagged with athletics, Colorado 100, Forerunner 305, Garmin, training, ultra marathon kayak/canoe.